take along for the ride a Jewish friend who had just returned from a tasting trip to Tel Aviv, and he confirmed the quality and authenticity of the food here. However, repeated questions about whether or not if it was Kosher I think remained largely unanswered. 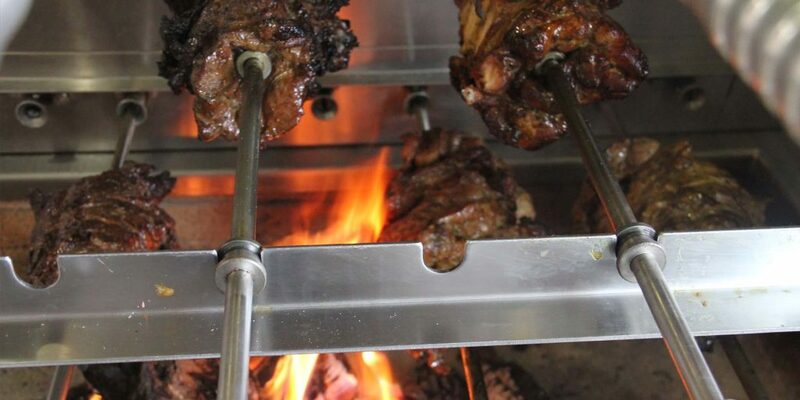 with souk’s dry rub, and lamb which is hormone free halal lamb marinated in pomegranate & chile. My favorite of course is the Merguez Shawarma, which is a spicy Moroccan sausage made from lamb that comes with roasted onions and a variety of sauces. There are not a lot of places around town serving Merguez, so the fact that this place has it gives it an immediate plus in my book. Vegan’s are also catered to here with the Sabih ($6.99), roasted eggplant with a Mediterranean salad, hardboiled egg and tahini sauce and zhoug. The vegan shawarma ($8.99) is made with non-gmo soy protein, seasoned with herbs and spices and served with tahini sauce along with oven blistered tomatoes and a souk mix. You might want to try the baby Popcorn Falafels ($4.99) that are topped with fried herbs and served with green tahini and a spicy zhoug sauce. Also go for the Souk Fries ($3.99) that are prepared with Za Atar and a garlic sauce, or the Dirty Fries ($7.99), French fries topped with beef shawarma, feta cheese, harissa and green onions. If you like hummus and who doesn’t, it comes in two varieties, regular and avocado. Even one better is the Hummus Bowl, which is topped with protein sautéed garbanzo beans, tahini & lemon sauce, olive oil and served with pita bread. Souk Shawarma shares the space with a French bakery called SUCRE, which is also run by a famiiy member. Here you get the chance to try Parisian ice-cream and some delicious Madeleine pastries.